BUILT FOR SPEED: Cruise blazes a trail in this scene from the box-office-topping action thriller. 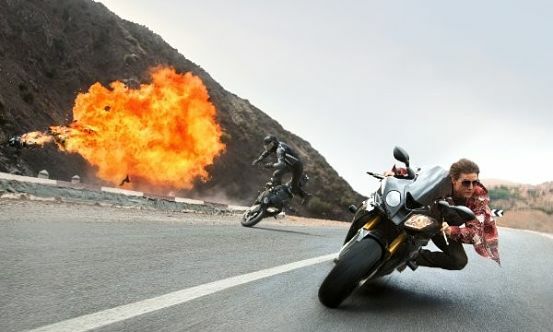 Whether chasing war criminals from London to Vienna, performing all manner of superhero derring-do or making one narrow escape after another, Ethan Hunt (Tom Cruise) embodies daredevil with a capital D. The agent’s fearlessness and utter bravado continue to anchor the Mission Impossible franchise, making it blockbuster entertainment worth standing in line for. Sure enough, the latest in the series, Rogue Nation, packs the requisite thrills and edge-of-your-seat action-adventure that fills auditorium seats. When a sinister terrorist organization that goes by The Syndicate starts wreaking havoc across Europe, assassinating even the Austrian Chancellor, Hunt goes hot on the trail of its elusive leader Solomon Lane (Sean Harris), a tough nut who enlists agile agents like the slinky femme fatale Ilsa (Rebecca Ferguson) to perform much of its dirty work. After saving his life, Ilsa strikes up an alliance with Hunt, but can he trust a woman who’s been trained to kill enemies like him? Whose loyalties lie chiefly with shady British Intelligence? Hunt and his CIA crew, including tech wiz Benji (Simon Pegg), longtime pal Luther (Ving Rhames) and Jeremy Renner as Agent Brant, have their work cut out for them in bringing down The Syndicate and stopping a deadly cycle before the British Prime Minister becomes the next victim. As expected, this mission is no walk in the park. Cruise could use the exercise. The screen veteran hasn’t seen this much action since he and Cameron Diaz rocked the boat in 2010’s Knight & Day (and 2011’s Ghost Protocol), but he’s as sharp and fleet-footed as ever, while stylishly blending conviction and charisma to winning effect.